Silver Bear Announces Completion Of | Silver Bear Resources Plc. June 9, 2016 – Toronto, Ontario – Silver Bear Resources Inc. ("Silver Bear" or the "Company") (TSX: SBR) is pleased to announce the results of a National Instrument 43-101 (“NI 43-101”) feasibility study (the “Study”) for the Vertikalny Central deposit of its Mangazeisky Silver Project (the “Project”) in the Republic of Sakha (Yakutia), Russia. NI 43-101 Technical Report in respect of the Study and the Project will be filed on SEDAR within 45 days of this release. The pre-tax NPV at a 5% discount rate is US$79.7 million, the pre-tax IRR is 43.6%, and the payback period is 2.1 years. With the Far East Tax Incentives, the post-tax NPV at a 5% discount rate is US$70.7 million, the IRR is 40.2%, and the payback period is 2.2 years. Assumptions include a variable silver price of US$16.00/oz, US$17.25/oz, and US$18.00/oz during the first year of production, second year of production, and the remaining project life, respectively, with a life of mine (“LOM”) weighted average silver price of US$17.74/oz; exchange rate applied is RUB66.00/USD. Initial capital costs of US$48.6 million. Total Proven and Probable Mineral Reserves of 801,000 tonnes at a diluted average grade of 772 g/t Ag for 19.9 million troy ounces of silver. Total Vertikalny Central Indicated Mineral Resources of 23.4 million troy ounces of silver at an average grade of 909 g/t Ag, in addition to Inferred Mineral Resources of 13.4 million ounces of silver at an average grade of 615 g/t Ag. Processing an average of 110,000 tonnes of ore per annum. Average metallurgical recovery of 84.4% silver. The Company intends to take advantage of the favourable outcome of the feasibility study, and the positive outlook on the silver price, by implementing an aggressive fast-track execution plan to complete construction by the end of 2016, with steady state production starting in Q1 2017. In anticipation of this, and in compliance with the Russian regulatory approval process, a licensed Russian design institute (EMC Mining LLC (“EMC”) in St Petersburg) was commissioned in 2015 to complete the detailed design of the processing facility and associated mine site infrastructure. The Company procured all major equipment for delivery during the 2015/2016 winter road season and began construction. The Company has proceeded with construction in advance of regulatory approval for the project and expects that all of the permits needed for construction and operation will be in place prior to the start of production. More favourable weather between March and November will facilitate the completion of the construction of major infrastructure with specific focus on completing the buildings to provide shelter during mechanical and electrical installation and the start of commissioning planned for Q4 2016. The detailed Study results can be found in Appendix A. Study consultants were led by Tetra Tech (UK) and comprised an independent, multidisciplinary team including SRK Consulting (UK) Limited (“SRK”) and Environmental Resource Management Consultants Inc. (“ERM”). Each of the Qualified Persons noted below is independent within the meaning of NI 43-101 and has reviewed and approved the information in this release relevant to the portion of the Study for which they are responsible. Each has verified the underlying data relevant to the portions of the Study for which they are responsible. Environmental Resource Management Consultants Inc. The Company is also pleased to announce that on May 30th, 2016 it filed the NI 43-101 Technical Report (“Technical Report”) for the Mineral Resource estimate update of its Mangazeisky North deposit, located within its wholly-owned Mangazeisky Project. Tetra Tech (UK) prepared the Technical Report and it supports the Company’s announcement of April 13, 2016. To view and download the Technical Report, please visit www.sedar.com under the Company’s profile. The report will also be available on the Company’s website at www.silverbearresources.com. Silver Bear (TSX: SBR) is focused on the development of its wholly-owned Mangazeisky Silver Project, covering a licence area of approximately 570 km2 that includes the high-grade Vertikalny deposit, located 400 km north of Yakutsk in the Republic of Sakha within the Russian Federation. The Company was granted a 20-year mining licence for the Vertikalny deposit in September 2013 and completed a Feasibility Study in Q2 2016. Other information relating to Silver Bear is available on SEDAR atwww.sedar.comas well as on the Company's website atwww.silverbearresources.com. This release contains forward-looking statements and information within the meaning of applicable securities laws. Wherever possible, words such as "intends", "expects", "scheduled", "estimates", "anticipates", "believes" and similar expressions or statements that certain actions, events or results "may", "could", "would", "might" or "will" be taken, occur or be achieved, have been used to identify these forward-looking statements. All of the results of Study of constitute forward-looking statements and information, including estimates of internal rates of return, net present value, future production, proposed mining plans and methods, mine life estimates, cash flow forecasts, metal recoveries, and estimates of capital and operating costs. Furthermore, with respect to this specific forward-looking information concerning the development of the Mangazeisky Project, the company has based its assumptions and analysis on certain factors that are inherently uncertain. Uncertainties include among others: (i) weather conditions; (ii) unforeseen changes in geological characteristics; (iii) metallurgical characteristics of the mineralization; (iv) the ability to develop adequate processing and other infrastructure; (v) the price of silver; (vi) the availability of equipment and facilities necessary to complete development; (vii) the cost of consumables and mining and processing equipment; (viii) unforeseen technological and engineering problems; (ix) accidents or acts of sabotage or terrorism; (x) currency fluctuations; (xi) changes in laws or regulations; (xii) the availability and productivity of skilled labour; (xiii) the regulation of the mining industry by various governmental agencies; and (xiv) political factors. Although the forward-looking statements contained in this release reflect management's current beliefs based upon information currently available to management and based upon what management believes to be reasonable assumptions, Silver Bear cannot be certain that actual results will be consistent with these forward-looking statements or information. A number of factors could cause events and achievements to differ materially from the results expressed or implied in the forward-looking statements. Such risk factors include but are not limited to risk factors identified by Silver Bear in its continuous disclosure filings filed from time to time on SEDAR in addition to those stated above. These factors should be considered carefully and prospective investors should not place undue reliance on the forward-looking statements. Forward-looking statements necessarily involve significant known and unknown risks, assumptions and uncertainties that may cause Silver Bear's actual results, events, prospects and opportunities to differ materially from those expressed or implied by such forward-looking statements. Although Silver Bear has attempted to identify important risks and factors that could cause actual actions, events or results to differ materially from those described in forward-looking statements, there may be other factors and risks that cause actions, events or results not to be as anticipated, estimated or intended. There can be no assurance that forward-looking statements will prove to be accurate, as actual results and future events could differ materially from those anticipated in such statements. Accordingly, prospective investors should not place undue reliance on forward-looking statements or information. These forward-looking statements and information are made as of the date of this release, and Silver Bear assumes no obligation to update or revise them to reflect new events or circumstances, unless otherwise required by law. This release also contains references to estimates of Mineral Resources and Mineral Reserves. The estimation of Mineral Resources is inherently uncertain and involves subjective judgments about many relevant factors. Mineral Resources that are not Mineral Reserves do not have demonstrated economic viability. The accuracy of any such estimates is a function of the quantity and quality of available data, and of the assumptions made and judgments used in engineering and geological interpretation (including estimated future production from the Mangazeisky Project, the anticipated tonnages and grades that will be mined and the estimated level of recovery that will be realized), which may prove to be unreliable and depend, to a certain extent, upon the analysis of drilling results and statistical inferences that may ultimately prove to be inaccurate. Mineral Resource estimates may have to be re-estimated based on: (i) fluctuations in the silver price; (ii) results of drilling, (iii) metallurgical testing and other studies; (iv) proposed mining operations, including dilution; (v) the evaluation of mine plans subsequent to the date of any estimates; and (vi) the possible failure to receive required permits, approvals and licenses. Mineral Reserves are also disclosed in this release. Mineral Reserves are those portions of Mineral Resources that have demonstrated economic viability after taking into account all mining factors. Mineral Reserves may, in the future, cease to be a Mineral Reserve if economic viability can no longer be demonstrated because of, among other things, adverse changes in commodity prices, changes in law or regulation or changes to mine plans. Note: The Far East Tax Incentives (Russian Federal Law No.267-FZ) allows the use of a reduced tax rate for profit tax purposes—zero rate for federal tax and a reduced rate for regional tax based on a prescribed time frame. Cash costs include all on-site operating costs (mining, processing, and general & administrative) and off-site costs (refining costs, silver transportation, and insurance). Capital costs include all the initial sustaining capital requirements. The Vertikalny Central deposit is a steeply dipping structurally controlled epithermal vein system that cross cuts the sedimentary host rocks. The mineralisation is expressed as breccias comprising siderite-sphalerite-galena and silver sulphosalts. Mineralisation is usually associated with the presence of vertical dykes of intermediate to basic composition. At Vertikalny Central a total of 237 holes have been drilled and 42 trenches excavated over a strike length of 2 km since 2007. In total, 34,384 m have been drilled, and trench excavations extend to 1,689 m.
Mineral Resources for a series of satellite deposits included in the Mangazeisky property are summarised in Table 1 below. The satellite deposits include Vertikalny Northwest located 1 km to the north of Vertikalny Central, Nizhny Endybal situated approximately 2.5 km east of Vertikalny Central, and the Mangazeisky North deposits located 7 km to the north of Vertikalny Central. Table 1 provides a summary of all of the Current Mineral Resources within the Mangazeisky property. The Indicated Mineral Resource at Vertikalny Central are inclusive of the stated Mineral Reserves. Notes: The effective date of the Vertikalny Central and Northwest Resource is 10th of February 2015. The effective date of the original Nizhny Endybal Resource estimate was 11th of September 2012, this resource was re-stated with a higher cut-off grade on the 10th of June 2015. The effective date of the Mangazeisky South Resource is 10th of June 2015. The effective date of the Mangazeisky North Resource is 31st March 2016. Resource estimates were completed in Geovia Surpac version 6.7, using 3D block models. Silver grades were estimated using ordinary kriging. Density was estimated using inverse distance weighting. The density at Nizhny Endybal, Vertikalny Northwest, and Mangazeisky South was assigned based upon arithmetic mean sample results for relevant domains. Grade interpolations were constrained within appropriate wireframe modesl representing minereaization and lithologies. Overall silver recoveries of 90% were assumed at Vertikalny Central and Northwest, and 80% recoveries were assumed at satellite deposits. Mineral Resources that are not Mineral Reserves to not have demonstrated economic viability. There are no known legal, political, environmental, or other risks that could materially affect the potential development of the mineral resources. Mining will comprise two sequential phases: open pit and underground. The open pit (the first four years of production) will consist of a conventional drill, blast, load, and haul operation, using the current fleet on site, supplemented with leased equipment. Capital for the open pit will only be spent on trucks, lighting units, pumps, site office facility, and light vehicles. As Vertikalny is a steeply dipping ore body in the range of 60 to 90°, for underground mining the shrinkage stoping method using a modern, trackless style operation with electrical powered jumbos will be employed. Mining will advance from the bottom upwards in horizontal slices, with a portion of the broken ore left in place from which miners can work. Three areas were identified for the mine design: the North, Central, and South zones. The North and Central zones will be accessed by ramp and the South Zone by adit. In accordance with Russian standard practice the open pit design includes 30% dilution and 95% mining recovery. Given the selectivity of the underground mining method and equipment, the dilution was limited to 15 cm on each of the hanging wall and footwall (30 cm total) and integrated into the stope optimisation process. It is assumed that 95% of the diluted material, including pillar material, will be recovered. The open pit and underground cut-off grades are 250 g/t and 405 g/t, respectively. The Mineral Reserve statement is as of September 30, 2015 and is shown in Table 2 below. The feasibility study process plant design is based on 110,000 t/a capacity, with a LOM average silver grade of 772 g/t, and is expected to provide an average silver recovery from oxide ore of 85.0%. The average silver recovery of the primary (unoxidized) ore (a small portion of the plant feed scheduled at the end of mine life) is expected to be 69.6%. The process flowsheet consists of a standard crushing and grinding circuit, followed by gravity concentration and cyanide tank leach of the gravity tails. The gravity concentrates will be processed by intensive cyanidation. The leached slurry from the tank leach and intensive cyanidation will go through a simple counter current decantation washing system and the pregnant solution will be processed by direct electrowinning to recover silver metal in powder form with a purity exceeding 99.9% Ag. The tailings management facility (“TMF”) will consist of a dry stack facility, contained within a fully-lined pad, surrounded by a series of containment bunds. A clarification pond to store all process affected fluids before retreatment is included in the design. The TMF will be constructed 0.2 km northeast of the plant site, and will cover an area of 7.69 ha. Approximately 0.8 Mt of tailings material will require storage over the 7.3-year LOM. The total estimated initial capital cost for the design, construction, installation, and commissioning of all facilities and equipment is $48.6 million (Table 3). The LOM operating cost estimate for the Project consists of mining, processing, and G&A costs (which includes TMF and site water management costs) and is estimated at $154.38/t processed (Table 4). 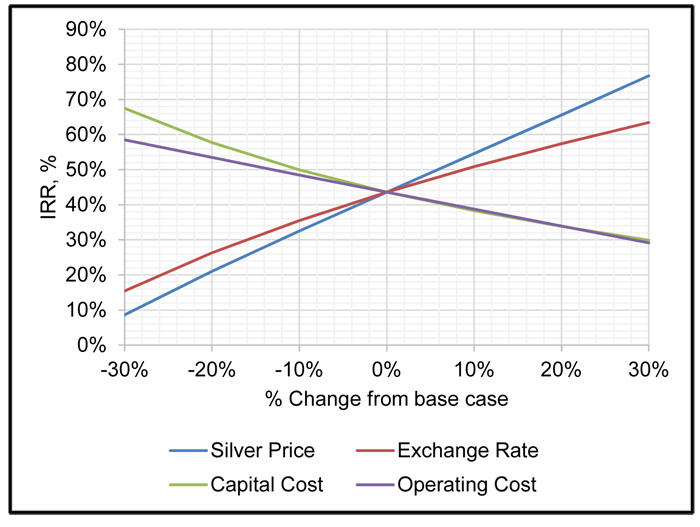 Tetra Tech investigated the sensitivity of NPV and IRR to the key project variables of silver price, exchange rate, capital costs and operating costs. 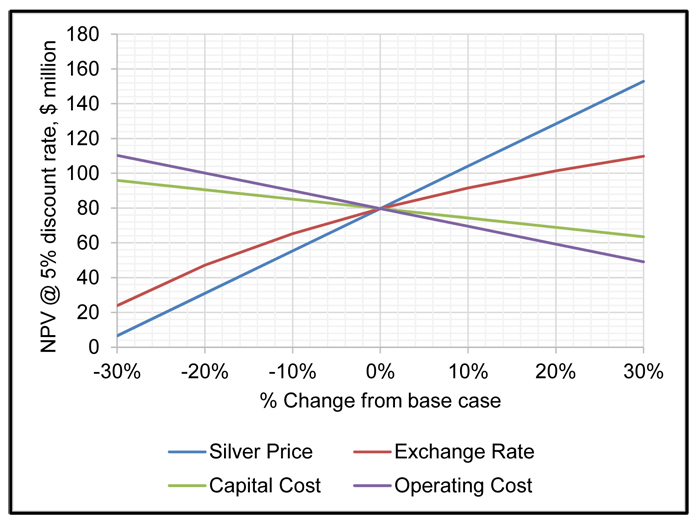 The Project’s pre-tax NPV, calculated at a 5% discount rate, is most sensitive to silver price followed by exchange rate, on-site operating costs, and capital costs, as shown in Figure 1. The Company plans to complete the Russian design documentation required for the State review by the end of Q2 2016. Following regulatory review and approval of the project, which the Company estimates could be granted in Q3 2016, the Company will be in a position to apply for a Permit for Construction, followed by the balance of construction and operating permits shortly thereafter. The Company acknowledges that there is a risk associated with undertaking construction in advance of obtaining the necessary regulatory approvals. It is possible that the regulatory approvals process may result in production delays and /or mandated design changes that may lead to modification of constructed site components.